About one and a half months ago, Huawei announced a powerful PHABLET Honor V8 (in the pictures), equipped with a 5.7-inch format Quad HD display and a proprietary eight-processor Kirin. It is now reported, this device will be a younger version of the model in the face of Honor 8. According to released data, the novelty will receive a 5.2-inch screen: in this version will be available with a resolution of Full HD (1920 × 1080 pixels) and Quad HD (2560 × 1440 pixels). On the back side of the body, like the older brother, is located twin 12-megapixel camera. For video telephony and selfie-shooting will meet front-facing camera with an 8-megapixel sensor. The hardware basis smartphone will provide eight cores Kirin 955 (quartet cores Cortex-A72 clocked at up to 2.5 GHz, and the quartet core Cortex-A53 at up to 1.8 GHz). The chip contains an integrated graphics controller Mali T880-MP4. The memory volume is 4 GB. 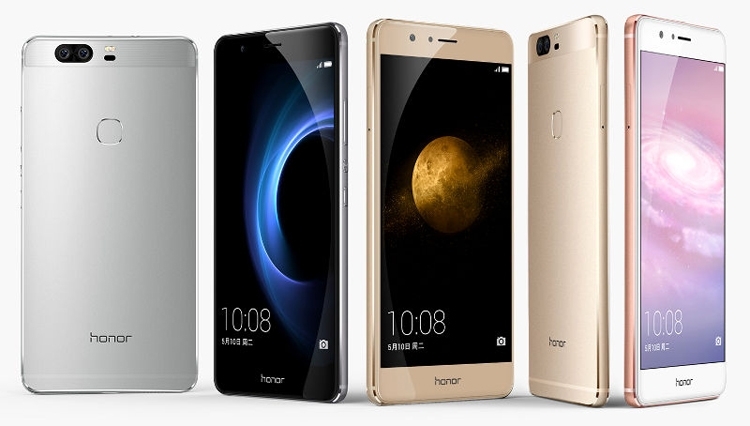 Honor 8 model will be available in versions with 32, 64 and 128 GB of expandable flash memory. Mentioned fingerprint sensor modules Wi-Fi 802.11a / b / g / n / ac, Bluetooth 4.2, GPS, NFC (older versions) and port USB Type-C. Battery capacity - 3200 mAh.